Last week Martijn ten Klooster (Pondera Consult) and Aaldert ten Veen (Stibbe) participated in the closed seminar organized by Sive, Paget & Riesel in New York, focusing on the ambitions of the state of New York regarding offshore wind energy. Governor Cuomo has set high ambitions. New York wants to have a 50% renewable energy supply by 2030. A significant share is to be supplied by 2.4 GW offshore wind farms, which means speed is of the essence. Last year, the first 30 MW of offshore wind energy was put into service. In 2019, over 800 MW is expected to be licensed. The seminar was centered around discussing the most important points for the development of 2.4 GW. This was done in panel groups consisting of local and regional authorities, developers and consultants. The discussions focused on the power grid (interconnectors, ac/dc, public or private grid, etcetera. ), the systematics of an environmental impact report (EIA), financing and supply chain, such as the availability of harbors. Martijn and Aaldert were asked to provide some insight into the lessons we have learned in Europe and in the Netherlands, by giving feedback on the panel discussions from a European perspective. The participation of Dutch experts produced interesting discussions and contacts. It is clear that American governmental institutions and businesses are aware of Europe’s expertise and success in wind energy, indicating that now is the right time for New York to develop it’s off shore wind energy. However, knowledge and experience are lacking which means there are plenty of opportunities for the Netherlands. • In order to anticipate rapid technical development of wind energy, EIA’s and permits need to be made as flexible as possible. Thus avoiding considering only the current state of technology. • Another important point is the consideration of the accumulated effects of multiple future wind farms. This can lead to competing and conflicting interests between wind farms and the delay of procedures. • A few months should be taken to create a thorough plan of action, both for the EIA and the general organization, to make sure the goals can be realistically achieved. Take for example the Dutch road map for offshore wind energy which is a good base for the development of future wind farms. An important point is to also highlight positive financial side effects of, for example, offshore power hubs. 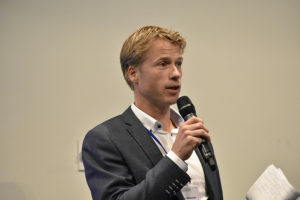 If you have any questions about the opportunities for wind energy in New York or Pondera Consult’s activities, please contact Martijn ten Klooster (m.tenklooster@ponderaconsult.com/ +31 6 46 111 889).